Have you decided whether you're going to join in? If you are, have you decided how you're going to record your thoughts? I hope the previous posts have helped rather than making you more confused. Thanks to everyone who is planning to join in how ever much or how ever little you have time for. 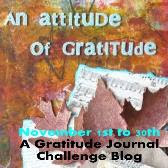 See you next Thursday for our final Thankful Thursday before we start out November challenges.